Like many daughters, Jordan Anderson has a few things in common with her mother. Off the ice that is. On the ice, Anderson, a 17-year old defenseman for the Madison (Wis.) Capitols Girls 19 & Under team, takes care of her own end of the ice first and likes the physical side of the game. Her mom Kristi Anderson, on the other hand, is an offensive-minded forward for the Illinois Stars Women’s Over-30 team who likes the puck on her stick. “We’re both really competitive, but we’re very different players,” Kristi said. 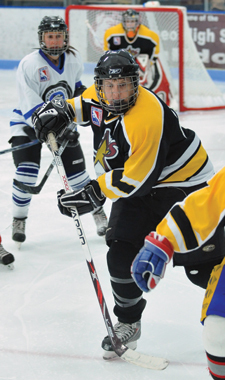 The pair competed in the 2011 USA Hockey Girls and Women’s National Championships over back-to-back weekends in Michigan at the Onyx Rochester Ice Arena and the Suburban Ice Macomb rink. “It’s a great story, and it really shows how much female hockey has grown,” said Jessie Vetter, a goalie on the U.S. Women’s National Team and an assistant coach for the Capitols. With the Stars berth in the Women’s Nationals already locked up, the Capitols won the Wisconsin state championship, and then beat St. Louis and archrival Chicago Mission to earn the Central District title and the trip to metro Detroit. While the Capitols won only one game in the preliminary round, and the Stars lost in the finals of the Over-30 tournament, the two could still smile about the experience. The Andersons are close and both point to hockey as one of the main reasons why. 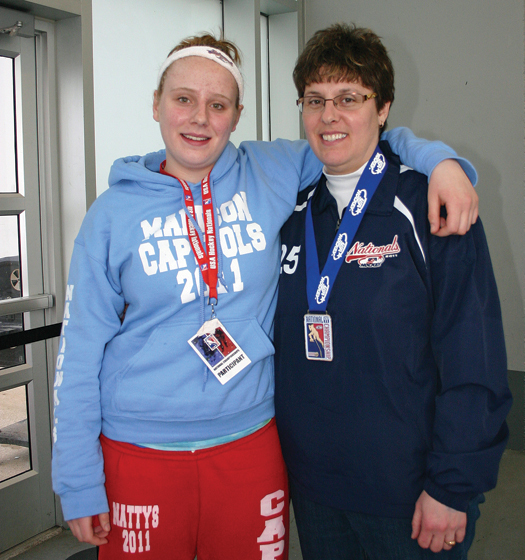 After playing for the Mission Kristi Anderson and her daughter Jordan capped off their seasons by competing for National titles at USA Hockey National Championship events. last year, Jordan joined the Capitols organization this season with the hope of better balancing academics and a competitive hockey schedule. Switching teams meant more time in the car – the pair made the hour and 45-minute trip from their home in northwest suburban Chicago to Madison three times a week – but less time out of school for Jordan, a junior who is fourth in her class of 583 students at Huntley High School. The two of them usually headed to Wisconsin on Fridays after school let out, and while most hockey parents relish that car-time as a chance to talk to their kids, Jordan spent almost every minute of the commutes with her nose buried in schoolwork. Capitols coach Bob Suter, a member of the 1980 U.S. Olympic team, is happy with how the Anderson’s package deal turned out. After getting married, Kristi started playing on a beginner women’s team at Fox Valley Ice Arena in Geneva, Ill.
Jordan and Kristi have visited several colleges in the East – and Jordan is excited about going to a school with a good combination of academics and hockey.